Show pride in your favorite team everywhere you go with a set of high quality, Texas Longhorns Heavy Duty Vinyl Car Mats from Fanmats™. The 2-piece car mat set has a non-slip grip backing, raised outer rim with multi-level channels and universal fit that makes it ideal from cars, trucks, SUVs, and RVs. 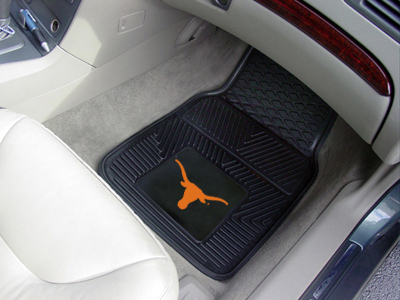 The NCAA® officially licensed vinyl car mats are black and feature the Texas Longhorns logo in true team colors. Made in the USA.